New Mercedes C-Class Coupe revealed | What Car? This is the all-new Mercedes-Benz C-Class Coupe, which goes on sale in June after its world debut at next month's Geneva motor show. It's likely to cost from around 27,500 for the entry-level 115bhp 1.8-litre petrol model and Mercedes promises it will be 'an exceptionally sporty way to enter the world of Mercedes-Benz coupes'. The new four-seater is sportier looking than the heavily revised C-Class saloon it's based on and is a much more obvious smaller sibling for the E-Class Coupe than the CLC it replaces. Unlike the E-Class and CL coupes, the new C-Class Coupe has a pillar between the front and rear doors. Five engines are likely to start with. 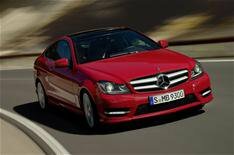 Besides the C180, there'll be a 201bhp C250 petrol and a pair of diesels developing 168bhp or 201bhp. The range-topping 302bhp C350 can sprint from 0-62mph in six seconds and on to a top speed of 155mph. Average fuel economy for this V6 is up to 41.5mpg, with CO2 emissions as low as 159g/km. Every model in the range will be fitted with engine stop-start as standard, helping the most efficient diesels to reach an average of 57.6mpg and emissions of 128g/km. The entry-level C180 is the slowest of the range, but can still accelerate from 0-62mph in 8.8 seconds. It returns an average of 43.4mpg and emits 150g/km.